Queen-mother Idia, Benin, Nigeria, now in Humboldt Forum, Berlin, Germany. Would she come back home to Benin City on a temporary loan? ‘As for the ownership status of the works, who does not know that Benin is the true owner despite the semantics and legalese by the international community? Towards the end of the above-mentioned article, under the heading, a MISSTEP and in CONCLUSION Shyllon launches a surprising attack on my person, by name, at least 4 times. I intended to ignore these comments because such attacks and responses might distract from the main objective, that is the restitution of looted African art to which both of us are committed but approach in different styles and ways, depending on our personalities and the opportunities we have to make our contributions. But I was advised that since he is making allegations of fact, in the interest of scholarship, somebody must answer, and I may be the best to do so. Besides, he may have been writing these attacks on behalf of a group of persons who cannot tolerate that an African, on his own, without being employed to do so, comments on the activities of persons selected by the museums and their governments to deal with an issue of common concern. The relevant parts of Shyllon’s article that may not be easily available to all are reproduced below for the reader’s convenience and also to allow quick reference to what is alleged and the answer thereto. (4) We shall also use his headings to facilitate the reader’s search for what we are commenting on as well as indicate the innuendos, insinuations, and hidden insults therein. 1. food for horses and farm animals. 2. (disapprovingly) (often after a noun) people or things that are considered to have only one use: Without education, these children will end up as factory fodder (=only able to work in a factory) This will be fodder for the gossip columnist. Since Shyllon himself criticises the BDG for rejecting restitution, why does he say that ‘it is ill-advised for him [Opoku] to dub it ridiculous and insulting? They are wrong but I should not criticise them. Why did we then go to university at all if in the end we cannot even criticize those who are wrong. Why? Because they are Europeans who would expect the usual African deference? Are they entitled to expect the same from those who have had the same or similar education as the Europeans they are dealing with? Shyllon declares that ‘It is possible that Dr. Opoku is unfamiliar with resolution of South Korea French impasse with regard to the Oe-KyuJangGak royal archives’. So Shyllon is accusing me here of ignorance. There may be some restitution cases that I am not familiar with but anyone who has even a cursory acquaintance with my hundreds of articles on restitution would be surprised that despite all my activities, I am unfamiliar with the most elementary case that is discussed in French-speaking circles whenever the issue of restitution comes up. I checked the author Shyllon’s sources of information and realized that he consulted and refers to several articles in Elginism. But this is precisely the place where I published a long note on the French-Korean dispute regarding the Korean royal manuscripts which I reproduced below in annex II. (4) Could I be unfamiliar with a case when I wrote a note on the same case nine years ago at the same place Shyllon was looking for information? Did he see my note or did he not? Besides, Shyllon has discussed the South Korean-French impasse in a contribution he made to Peju Layiwola’s book Benin 1897.com Art and the Restitution Question, pp.61-90. Immediately following Shyllon’s contribution is my own contribution, at pp.91-107, entitled ‘One Counter-Agenda from Africa: Would Western Museums Return Looted Objects if Nigeria and Other African States Were Ruled by Angels? (5) Did Shyllon presume that I would not read his contribution in a book where I also have a contribution? We presume that Shyllon has seen the notice on the Atelier juridique in Document 3 of the Sarr-Savoy report which he cites in his article. 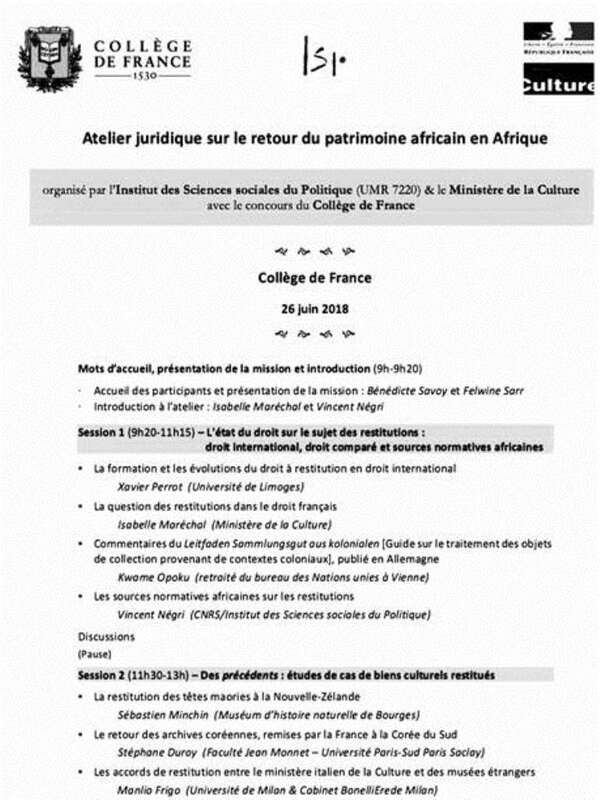 That notice clearly indicates that among the subjects to be discussed on 26 June 2018 at the College de France within the Atelier juridique, Legal Workshop, in the First Session was a paper by Kwame Opoku on the German Guidelines for handling of collections acquired in colonial contexts and in the Second Session a paper on the return of the Korean archives, returned by France to South Korea presented by Stephane Duroy, to be followed by discussions. He would also have noticed that in the Fourth Session in the afternoon, there was to be a reflection on the various models of return with discussants including Kwame Opoku. How can Shyllon then presume that it is possible that Dr. Opoku is unfamiliar with the French-South Korean impasse which was discussed by top French specialists on the issue? (6) A very strange presumption by someone who has read the Sarr-Savoy report. When Italians, Peruvians, Turks and others asked for the restitution of their looted artefacts, the artefacts were either returned as requested or were denied and nobody ever proposed to them loans of their own looted artefacts. The British Museum has proposed to the Greeks a loan of the Parthenon Marbles if they would recognize first the legal ownership of the British Museum. The proud Greeks have rejected the ridiculous offer. When Germans asked the Russians to return German artworks looted by the Red Army towards the end of the last world war, nobody spoke about loans. They were denied. Would they accept a loan of looted German works from the Russians? Yet Germans turn around and propose a loan of looted Benin artefacts to Nigerians. Has anybody ever proposed a loan of looted Chinese artefacts to China? Europeans have too much respect for the Chinese to make such a ridiculous proposal. But for Africans? As I write this article, I have received information that Italy is returning 800 artefacts to China Did they not think about loans? 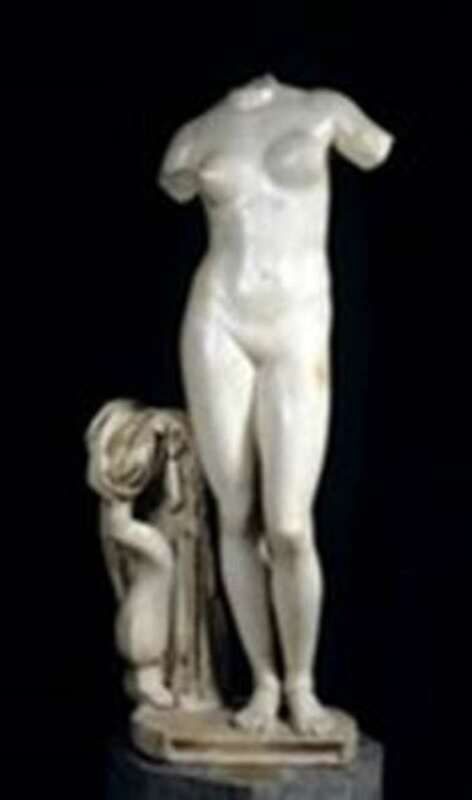 Venus of Cyrene looted by Italians in 1915 and restituted to Libya in 2008. Folarin Shyllon writes in his conclusion as follows. We will try to disentangle this bag of attacks as far as possible. a). Is it by refusing to take part in the activities of the Dialogue Group that the antiquities will return? Nobody has asked me whether they should take part in the activities of the BDG or not but if I should be asked for advice, I would answer as follows: Talk to them by all means but if they declare clearly that the question of restitution is not part of the agenda, you must decide whether it is worth your while to attend such a meeting. 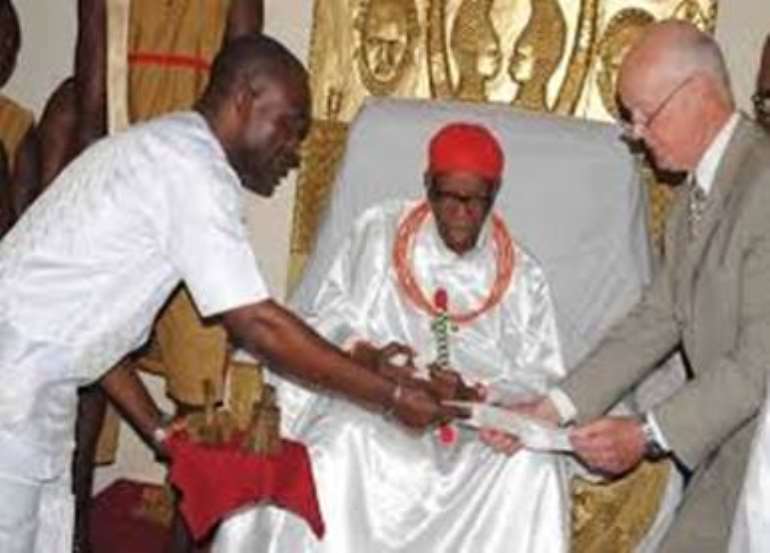 Prince Edun Agharese Akenzua, Enogie of Obazuwa, representative of the Oba at the meeting which discussed the so-called Benin Plan of Action in 2013, is reported to have declared that’ there is nothing in the Plan of Action that really addresses restitution ‘. Aggressive and determined: He is a strident advocate of nuclear power, strident criticism. Bird of Prophecy and a gong looted by the British in 1897 and returned to Benin by Dr. Mark Walker in 2014. It is clear, even from his own writings that the assertion that no artefact was returned to Africa in the period that, i.e.2007-2019, cannot be sustained. The evidence against that assertion is simply overwhelming. Since Shyllon was also writing during this period, should both of us stop writing? 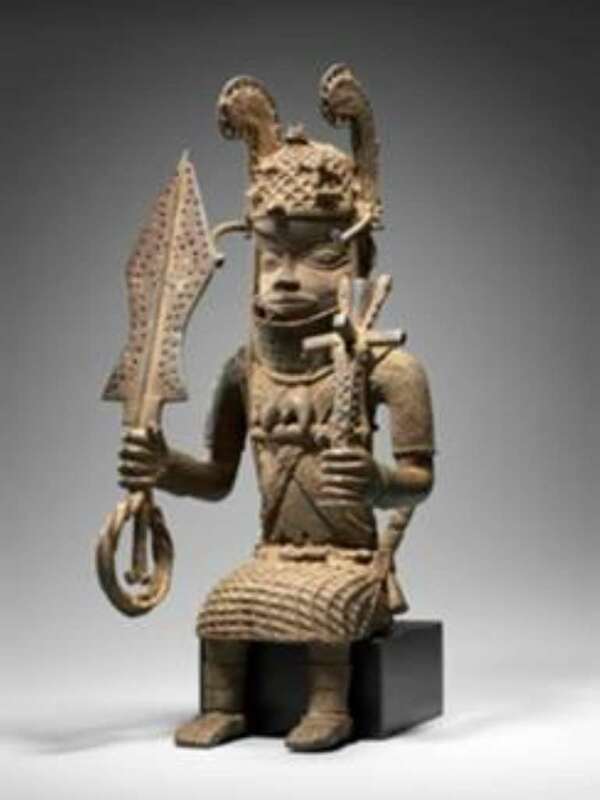 Two of the artefacts, Nok and Benin, that the Museum of Fine Arts, Boston returned to Nigeria in 2014. 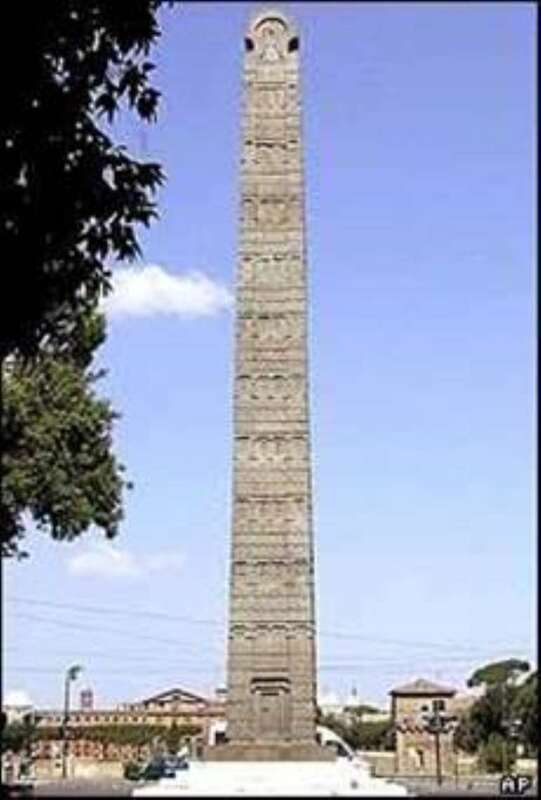 Obelisk from Axum was in Rome for decades before returning home in 2008. Syhllon’s statement that no article was returned in the period is also remarkable from another point of view. Did anybody ever believe that, the looted artefacts would be restituted as a result of an article or articles? We are not so naïve as to overestimate the power of our writing. My writing is not aimed directly at bringing home the looted artefacts for more is required than that. My aim has been to keep the restitution question, especially as regard the Benin treasures, on the agenda of all and in that respect, some suggest that I have achieved a measure of success. My other aim has been to inform our African public about the issues in this field and to equip our youth with sufficient arguments for discussing them. Most of our governments and their institutions have not considered the importance of public education and in many cases mislead the public. When the question of a loan of the Benin bronzes is discussed, the differences between returning an object on loan and restitution are obscured so that when people hear that Benin bronzes are coming home, they believe they are returning forever and are not informed that the items are on loan for a limited period. Nobody informs us about the length of period of the loan, who pays for the transportation and the cost of the loan and the insurance premium. Nobody tells us about the numbers involved and which museums are sending which objects. The immunity from legal process that was sought for the looted objects to be returned to Nigeria is no longer openly mentioned. Indeed, the holders of the looted artefacts have till today, with a few exceptions, not told us the total number of Benin objects they are holding. We have from time to time established a list of holders of the Benin bronzes and their numbers. Nobody has corrected our numbers. They prefer the public to remain uninformed and yet this will be the minimum we could expect from the holders of the Benin artefacts. We are left in the dark. d). Therefore, the reproach to ‘some Africans’ engaging in a dialogue with Western museums is misguided. We have no objections to engaging in discussions with Western museums. After all, they are still holding our looted treasures. But if they declare they do not want to talk about what we consider a priority, i.e. the restitution of Benin and other treasures, the question arises whether there is any point in talking to them. Talk to them about building museums which should be none of their business.? Nigeria can surely build her museums without submitting her plans to the imperialist holders of the Benin bronzes. Nigerians are not beggars. e). Is half a loaf not better than none at all? An ‘all or nothing’ approach to restitution has proven to be a road that leads nowhere. Does Shyllon have here information which we are not aware of? Have the Germans perhaps stated that they would share the bulk of 508 to 580 Benin artefacts they have in Berlin? If half a loaf here refers to half of the 508 pieces, I would gladly accept the 254 pieces. Thus sometimes, half a loaf would be acceptable but not always as Shyllon seems to assume. If we know that Ethiopia would be the next to ask for her artefacts or has already asked for them, half a loaf would be prejudicial to their claims after Nigeria has accepted half-a loaf of what is available. 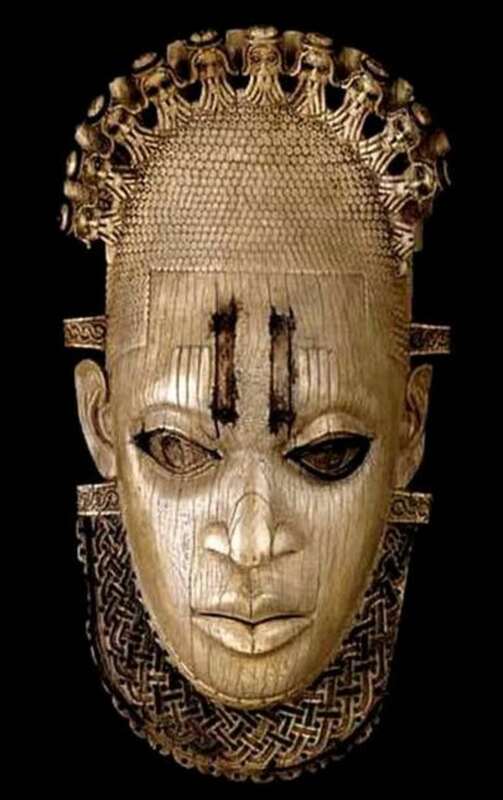 Could the Ghanaians probably, pragmatically, accept half of the looted Golden Mask in the Wallace Collection and thus destroy forever the sculpture said to be the finest specimen of Asante skill in gold works? I can tell Shyllon that if Nigeria goes through with a loan of her looted artefacts, Ethiopia, Ghana and all other African States would be told in future that they will have to accept loans as Nigeria has done and that it would be unfair to Nigeria to give them a better deal. Let us all mark this. We should have no illusions. Loan of an artefact is not half way or pre-step to restitution. The two concepts are different and any idea that Nigeria/Benin could get a loan now which may in future be converted to restitution is a grave mistake. There is no ground to believe, with all due respect, that those who are not willing to consider restitution now will somehow change their minds in due course and accept restitution. This can only be entertained on the basis of misunderstanding or underestimating the determination not to part with artefacts the Europeans and other Westerners have detained for more than a hundred years. There has never been a better time for restitution than now. Besides, there is no doubt as to which is preferable. Whilst the one puts Nigeria in a position of dependant, the other would make Nigeria owner of the objects. Whereas restitution signifies the beginning of a new era, a loan guarantees the continuation of the old relationship of power and weakness, with all the possibilities of disputes not so much about the initial looting but about the implementation of the loan agreement. The terms of the loan agreement must be strictly observed and any pretence to ownership will surely be corrected. When the pressure on the European powers and museums is reduced, as it will be, whether we agree to loans or secure restitutions, there will be less interest for them to contemplate restitution; they would have overcome the bad conscience they all seem to have. The ability to mobilize support amongst the African peoples who have not been told the difference between restitution and loans, would be considerably reduced if not non-existent. e) If the British Museum and the Ethnology Museum, Berlin were today to declare that they would release 100 pieces each of the Benin antiquities in their possession, is there a museum in Lagos, Abuja or Benin City that can adequately house them and ensure their safety and proper handling? This question is properly addressed to those officials who are paid to preserve and protect Nigeria’s cultural heritage and have been provided the means to perform their functions. Whether the means are adequate or not, they have to settle that with the Nigerian parliament and authorities. But since the question has apparently been posed to me as a critic, I will try to answer as best as I can. This question is what I call idle hypothesis. It is like the question, what would you do if you were alone on an island in the Pacific.? We know very well you will never be alone on an island in the Pacific, but it is entertaining to discuss what you would do. The hypothesis of the two Western museums declaring their willingness to send 100 Benin pieces each to Nigeria, is idle speculation unless Shyllon as a member of the group has information that is not available to us. Should British Museum and Ethnology Museum seriously make such a declaration, we know that between the declaration and the date of implementation, there would be a period long enough to organize the reception of those pieces in Lagos, Abuja and Benin City. We should not forget that the Benin pieces were looted from the palace of Oba Ovonramwen in 1897. Is the present palace of the Oba not big enough to receive the pieces? We see in this angst about where to put 200 pieces a certain danger of internalization, at least partially, of the Western allegations about the incapacity of Nigerians and Africans to organize properly their affairs or to protect their cultural artefacts. 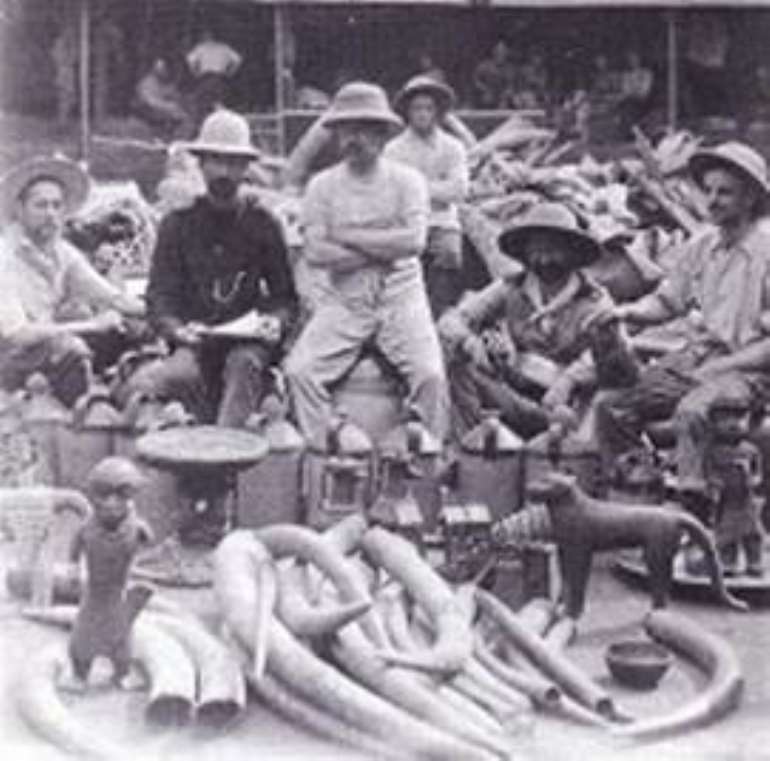 And this comes from those who looted Benin artefacts with military force in 1897. If Shyllon believes or expects that the British Museum and the Ethnology Museum, Berlin, are in the mood to return such large numbers of Benin artefacts to Nigeria, could he kindly ask them to increase the number to 200 pieces each? We would help to find a place for the returned Benin treasures. We should remember though that however Nigeria organizes its museums and other places for the looted artefacts, we would never be able to guarantee their security if superior force be used to loot them. And this is not idle speculation. of Nigeria’s looted artefacts. What have the responsible authorities been doing, making no preparations for those artefacts they are supposed to bring back? Shyllon could usefully ask such a question rather than throw the question at a critic who is not responsible for preserving and protecting Nigerian artefacts. This is a wrong addressee. 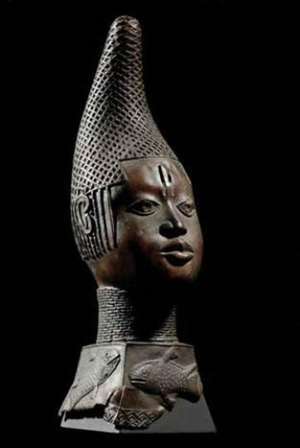 Queen-Mother Idia, Benin, Nigeria, now in British Museum, London, United Kingdom. Will she finally be allowed to return home in Benin City from British exile since 1897? Will the British play the same game as they played when Nigeria asked for the sculpture for FESTAC? ‘On the informational website modernghana, a former functionary of the United Nations and a miltant citizen, Kwame Opoku published over 150 articles beginning in 2008 carefully and beautifully documenting a favourable case for the restitution of items of African heritage to Africa’. Opoku is mentioned at least seven times in the book by Adebiyi who also attends the meetings of the BDG. We note also that some of Shyllon’s PhD candidates mentioned my strident articles in their thesis and still obtained their doctorates. One of them wrote,’’ There exist researches on the protection of cultural property and also the return and restitution of cultural property which provide important insights into the development of this thesis’. (21). f). An ‘all or nothing’ approach to restitution has proven to be a road that leads nowhere. We do not know where Shyllon got this idea that I follow what he calls all or nothing approach. He is falling into the same line as Philippe Montebello and others adopted, alleging that we want the West to return all African artefacts. (21) We have consistently argued that a substantial proportion of looted African artefacts would have to be returned from the West and that what is to remain would have to be settled by the African and the Western parties. We have had to explain that ‘some’ does not mean’ all’. We have argued that the Germans must share with Nigeria the 508-580 Benin artefacts that they are keeping in the Ethnology Museum. Is this an all or nothing approach? Does Shyllon read my articles that he is ready and willing to condemn? g). Be that as it may, the dissembling on the issue of restitution in the Leiden Statement is unfortunate. It is a backward step that is quite unnecessary. The Dialogue Group started unambiguously with the twin objectives of restitution and lease. They are two sides of the same coin, and it is quite unhelpful to abandon restitution in the Leiden Statement. Shyllon thus states that the BDG was wrong in removing restitution from its agenda but argues that Still, the criticism of the Dialogue Group by Kwame Opoku leaves much to be desired. g) Shyllon ends his article as follows: It is suggested that restitution as a matter of interest to the Group should be reinstated when it convenes in Benin City in 2019. Restitution should at least remain as a vision of the Group, if not, for now, part of its mission. If Shyllon feels that restitution should remain part of the agenda of the Benin Dialogue Group, what then is his real ground for launching an attack on Kwame Opoku, for criticizing the group’s removal of restitution from its agenda? Is he writing on behalf of some persons who think an African should not feel free to criticize them when they are wrong? An independent-minded African critic irritates those with racist ideas. Shyllon’s comments will now make it difficult for the group to re-insert restitution on their agenda if they do not want to lose all credibility. Without Shyllon’s comments and the consequential response, the group could have declared that their initial removal of restitution from their agenda for that session had been misunderstood by critics and re-insert the topic. It is my turn to say that Shyllon should not have written the article as he did. He was there when the decision was taken to remove restitution from its agenda. He could have told them during the discussions that it was wrong so to decide. Not having done so, after the meeting, he could have informed the members about his opinion. Now he has publicly shown they were wrong and offered even more grounds than Opoku did to show why they were wrong. If the Benin Dialogue Group does not want to discuss the restitution of Benin artefacts, who then will do that? Who will discuss restitution of Nok, Igbo Ukwu, Ife, Tsoede, Owo, Esie, Calabar and the others looted Nigerian artefacts in Western museums? And how long will they need to discuss Nigerian artefacts before they come to Ethiopian, Cameroonian, Ghanaian and other African artefacts looted in the colonial period? Hunter with antelope, Lower Niger, Nigeria, now in British Museum, London. We take note of the Shyllon’s statement that Oba Ewuare II ‘delegated his uncle, Prince Gregory Akenzua, `a Professor of paediatrics to represent him’ and that ‘the Kings of Benin clearly know how to pursue claims for the return of their antiquities’. Let us make no mistake. The decision to remove restitution of Benin artefacts from the agenda of the BDG is a great victory for the West and its museums, sweeping aside with a stroke decades of debates for the restitution of the Benin artefacts. If this succeeds, no other African peoples can ever hope for restitution of their looted artefacts. African scholars must be aware of these implications and decide which side they support. They cannot be neutral. They cannot be for both sides in this debate. I must put on record my great disappointment at reading Shyllon’s attacks whether he did this on his own accord or on behalf of others who do not feel like doing so openly, does not matter. If they do not want criticism of their group, they should do the right thing. Furthermore, Shyllon cannot play party and judge in his own case. He has taken part in the decisions of the Benin Dialogue Group from the beginning to date. He should convey his views to them but not try to attack others and present himself as an impartial judge, praising others and critizising others. He has offered strong grounds for criticising the decision of the BDG to remove restitution from its agenda. 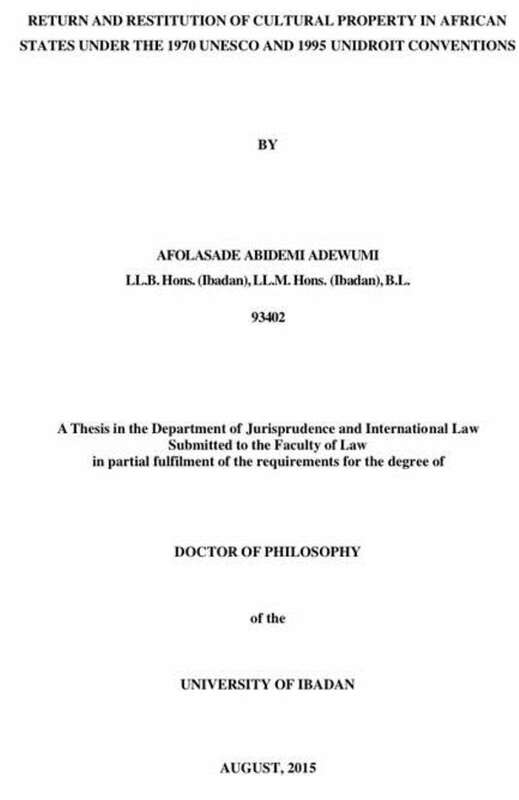 When I started writing on these issues some years ago, an African friend, at the highest levels of legal and judicial services of international organizations, drew my attention to the writings of a Nigerian scholar and ever since then I have read with interest and profit, all contributions by Folarin Shyllon that are easily available. I have quoted him in several articles although the first time he has referred to my contributions has been to criticise me. This latest article is one I would like to forget and ignore among his otherwise excellent contributions. We may never know the truth about these unprecedented attacks, but it is disheartening that one of Nigeria’s leading authorities on these questions should write such a piece. He was definitely ill-advised, ill-inspired and his article was ill-conceived. Art, Antiquity and Law, Vol. XXIII, Issue 4, 341-347, Dec.2018. 3. 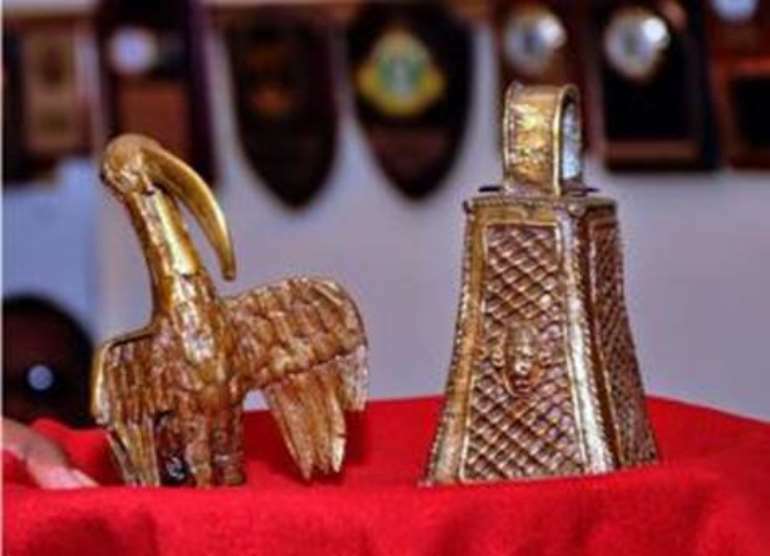 Nigeria To Borrow Looted Nigerian Artefacts From Successorhttps://www.modernghana.com/.../nigeria-to-borrow-looted-nigerian-artefacts-from-s..
10. Preface to Benin 1897. Com. Art and the Restitution Question by Peju Layiwola, 2010, Wy Art Editions, Ibadan. 11. Ibid. p.84, Shyllon,’Negotiations for the Return of Nok Sculptures from France to Nigeria: An Unrighteous Conclusion’. ‘'Prof Folarin Shyllon, Vice Chairman, UNESCO sub-Committee on Means of Prohibiting and Preventing the Illicit Import, Export and Transfer of Ownership of Cultural Property argued that the NCMM should have handled it with better caution. He noted that Walker did not put into consideration the fact that Benin as at the time of 1897 is different now, and under a nation state of Nigeria. Unrighteous Conclusion’ in Peju Layiwola (ed), op. cit. pp. 81 -89. 20. Legal and Other Issues in Repatriating Nigeria’s Looted Artefacts, 2009, p.32. 17 71 Bakula, C. Combating Trafficking in Cultural Property, The 1970 Convention: Evaluation and Prospects. Background Paper, second edition for participants in the Second Meeting of States Parties to the 1970 Convention Paris, UNESCO Headquarters, 20-21 June 2012; 72 Cordero, J.S. 2003. The Protection of Cultural Heritage: A Mexican Perspective. EXTRACTS FROM FOLARIN SHYLLON, BENIN GROUP DIALOGUE-BENIN ROYAL MUSEUM-THREE STEPS FORWARD, SIX STEPS BACK- Art, Antiquity and Law, Vol. XXIII, Issue 4, 341-347, Dec.2018. This is not the place to discuss the initiative of President Macron in Ouagadougou, nor the Sarr-Savoy report. 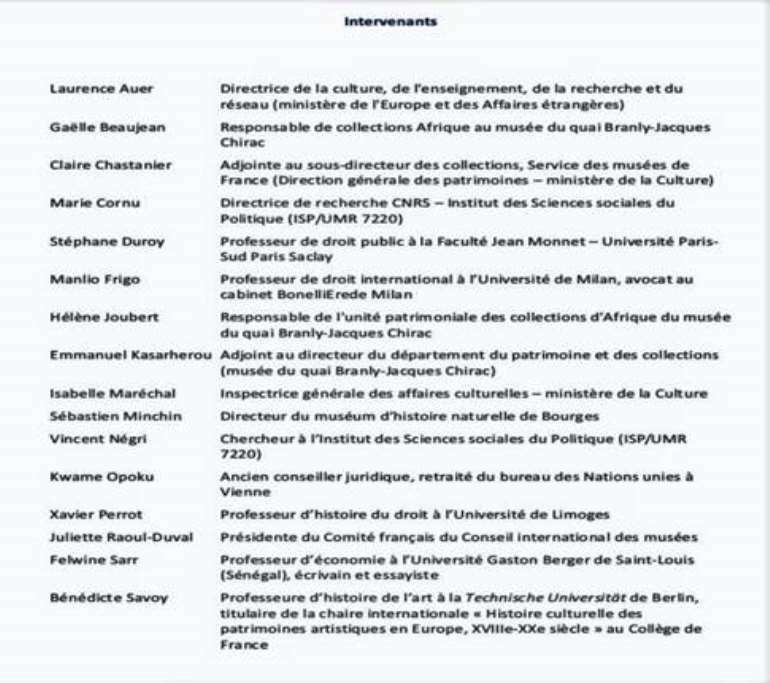 Both have however been referred to because the Macron initiative took place before the Benin Dialogue Group meeting in Leiden as well as the commissioning of Felwine Sarr and Bénédicte Savoy to look into restitution or loan of African cultural objects to Africa. That being so, the prevailing mood, at least on one side of the debate, should have been taken into account, and the wholesale rejection of restitution as a matter of interest to the group should not have been so carelessly jettisoned. The point is being made because it gives fodder to some critics of the Benin Dialogue Group. In a reference to the Cambridge Statement, Kwame Opoku wrote: “We have the so-called Dialogue Group on Benin proposing a strange scheme whereby some of the looted Benin artefacts would be displayed in Benin City, but ownership of the artefacts would be with Western museums. And they find some Africans to approve of such a ridiculous and insulting proposal (emphasis added).”12 It is possible that Dr Opoku is unfamiliar with the resolution of the South KoreaFrench impasse with regard to the Oe-KyuJangGak royal archives.13. In 1866, the French navy plundered the Oe-KyuJangGak royal archives and the manuscripts/ books in 297 volumes ended up at the Bibliothèque Nationale. In 1991, the Koreans began asking for their return.14 It was not until 2010 that President Nicholas Sarkozy decided to return them to South Korea. As usual the librarians and curators were opposed to the idea. They raised the red flag of inalienability of cultural property in French museums and archives.15 A French court ruled that the royal manuscripts belong to the National Library of France. Eventually, a creative solution was found. The manuscripts would go back to South Korea on a lease basis and the lease contract would be renewed every five years. In the words of the French President: “We have agreed [on a plan] in which the lease of the documents will be rolled over every five years.” Consequently, although to this day the manuscripts remain in French ownership, physically they are in South Korea where they are destined to stay forever. There is therefore already a precedent for what has been proposed. It is not “a strange scheme”, as Opoku suggested. And it is ill-advised for him to dub it “ridiculous and insulting”. From the start the Benin Royal Court has been an active member of the Dialogue Group. During his reign Omo N’Oba Erediauwa sent a representative to the meetings. Now that his son Omo N’Oba Ewuare II is on the throne, he too has been sending a representative to the Group meetings. At the Cambridge meeting, the first since Ewuare II ascended the throne, he delegated his uncle Prince Gregory Akenzua, a Professor of paediatrics to represent him. 12. 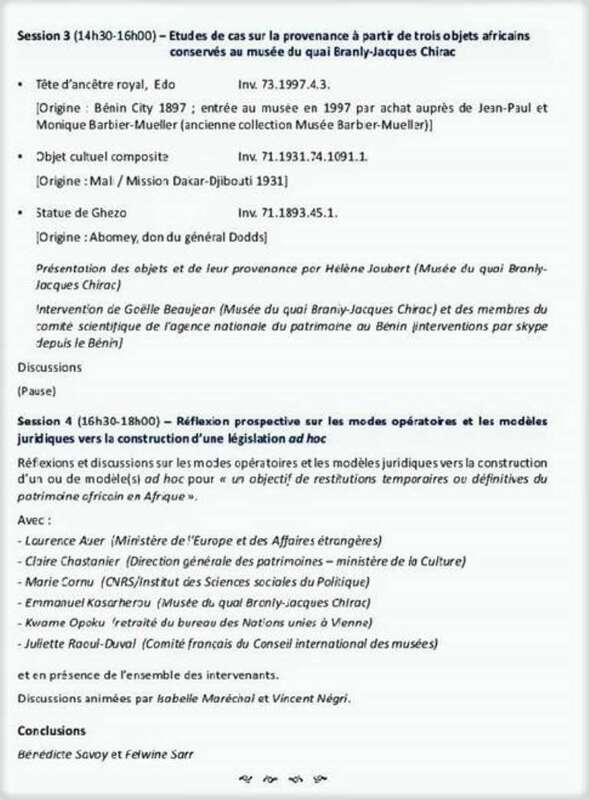 Kwame Opoku, ‘Macron Promises to Return African Artefacts in French Museums: A New Era in African- European Relationship or a Mirage?’ Modern Ghana, 10 Dec. 2017, 13. Elginism, ‘France to Return S. Korean Royal Documents’ 12 Nov. 2010, ; Elginism, ‘France Will Return Korean Kings’ Books’ 6 Dec. 2010, ; Elginism, ‘French Court Rules on Disputed Korean Manuscripts’ 19 Jan. 2010, ; Elginism, Kelly Olsen, 30 Jan. 2012 ‘Korean Royal Books Looted by French in the 19th Century Get Colourful Welcome’, . 14 See Jongsok Kim ‘The Oe-Kyujanggak Archives’ (2002) VII Art Antiquity and Law 7. 15 Article L. 451-5 Heritage Code (Code du Patrimoine). Prince Akenzua also represented the Oba at the Leiden meeting. Whilst both sovereigns continue to argue for the return of their ancestors’ antiquities, they felt it imperative for them to send delegates to the meetings knowing full well the limitations of the meetings. 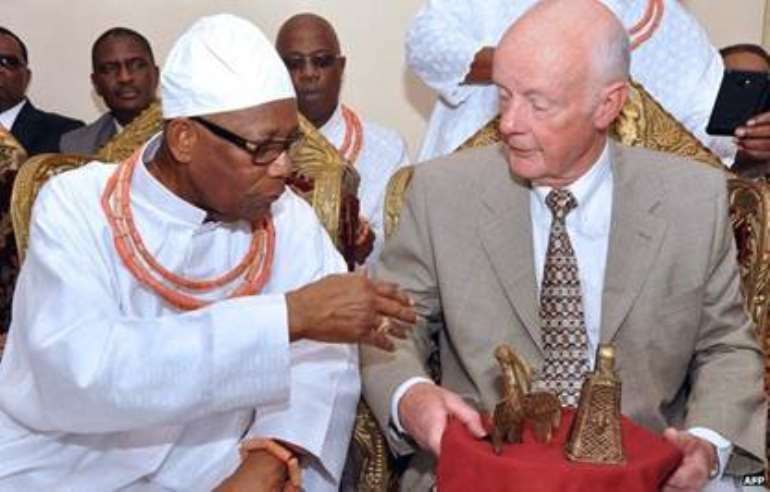 Furthermore, when Prince Charles visited Nigeria 6th-8th November 2018, it was reported by Nigerian newspapers that the Oba (King) of Benin requested the Prince of Wales to support the agitation for the return of some of the Benin bronzes to Nigeria.16 What is clear from this, despite what certain critics may say, is that the Kings of Benin clearly know how to pursue claims for the return of their antiquities. Is it by refusing to take part in the activities of the Dialogue Group that the antiquities will return? The author Opoku, referred to above, has over the years published many strident articles calling for the return of African artefacts. Yet no Benin bronze or other looted or stolen African artefact has over this period returned to Africa. Therefore, the reproach to ‘some Africans’ engaging in a dialogue with Western museums is misguided. Is half a loaf not better than none at all? An ‘all or nothing’ approach to restitution has proven to be a road that leads nowhere. Be that as it may, the dissembling on the issue of restitution in the Leiden Statement is unfortunate. It is a backward step that is quite unnecessary. The Dialogue Group started unambiguously with the twin objectives of restitution and lease. They are two sides of the same coin, and it is quite unhelpful to abandon restitution in the Leiden Statement. Still, the criticism of the Dialogue Group by Kwame Opoku leaves much to be desired. If the British Museum and the Ethnology Museum, Berlin were today to declare that they would release 100 pieces each of the Benin antiquities in their possession, is there a museum in Lagos, Abuja or Benin City that can adequately house them and ensure their safety and proper handling? The plan of action agreed to in Cambridge appears, in the meantime, to be a credible way to accept the yearnings of interested and concerned Nigerians in the matter. 16 Adelani Adepegba, ‘Return Our Artifacts, Oba of Benin Tells Prince of Wales’ The Punch, 6 Nov.
Commemorative head, Benin, Nigeria, looted in 1897, now in Musée du Quai Branly, to be restituted to Nigeria. I assume the officials at the French Bibliothèque National are conscious of what they are doing and are aware of the implications of their stand of the return of the looted manuscripts back to Korea. That copies of the manuscript exist in Korea is no argument against the return of the original to the country of origin. The French could also make copies before the originals are returned to Korea. Or are copies only good for Korea, the land that produced the originals but not for France, the land that took them away by military force? Here are links of leading website blogs on antiquities and artefacts that reported and analysed fully the various restitutions of the decade. The links below may be useful and show also how widely the issue was taken up by the press generally. Finders Not Keepers: Yale Returns Artifacts To Peru www.elginism.com/similar-cases/final-machu-picchu-artef . Penn Museum an "indefinite-term loan" to Turkey, not an ownership transfer. SOME VIEWS ON KWAME OPOKU’S ARTICLES. Leaving Athens for Africa, for the moment—nothing I heard at the two-day “Return of Cultural Objects” conference last week in Athens articulated as comprehensively, intelligently and passionately the arguments for return of objects to their countries of origin as the long article by Kwame Opoku appearing in Monday’s Modern Ghana. Opoku details and decries the various ways in which objects historically made their way from Africa to international museums, and he debunks in detail the arguments for leaving those objects where they are now. I don’t believe that everything should go back, as he appears to argue. (He previously took issue with my own views, as expressed in my LA Times Op-Ed on cultural-property issues.) But I do believe that source countries’ attachment to and passion for their heritage should be treated not dismissively (i.e., there are no Etruscans in modern Italy; more people can see more objects in Universal Museums than in the source countries), but with the utmost respect and seriousness. ratify or accede to these instruments. repatriation…. What is meant by “virtual and visual return which is offered as alternative to physical repatriation”? our dances and masquerades, instead of the physical objects? Can someone tell me how we can dance with a digitally repatriated mask? There’s a lot more provocative commentary where that came from. To view it, go to the article of origin (linked above). I’m really getting knocked lately. But I don’t mind when it’s a thoughtful, detailed, intelligent and passionate response. Many of the stolen cultural objects cannot simply be left where they are even if the owners agree finally to donate or, lend some of them….These are not just art objects, as Lee Rosenbaum may think. Many embody the unity and the spirit of the particular African people. These objects have to be returned, even if symbolically, so that our peoples see and feel that the long exile of their gods and kings has ended…. Besides, why should those who have been deprived of their cultural objects even think, at this stage, of making loans of the same objects to those who have been keeping them and still even today largely refuse to consider the issue of restitution? I will only say in self-defense that I never meant to suggest that everything should stay where it is. What I said is that “source countries, possessing more high-quality artifacts from their ancient pasts than they can adequately display, don’t need to get everything [emphasis added] back.” I did not say, nor do I believe, that they should not get anything back. I see a little patch of common ground in this quote from Opoku: “These objects have to be returned, even if symbolically.” Some objects, certainly the ones that “embody the unity and the spirit” of a culture, should be physically returned. Others may be able to stay where they are on loan, with a clear acknowledgement by the exhibiting institution of the source country’s ownership. Can’t we try to move from combativeness to mutually beneficial cooperation? Having said that, I will acknowledge that museums are clearly aware of repatriation imperatives involving European countries. But as Opoku would surely argue, and as recent events in Southern California have illustrated, there’s much more work to be done in addressing the cultural-property concerns of other areas of the world, including Africa and Southeast Asia. Download Kwame Opoku, " Declaration on ...Universal Museums: Singular Failure of an Arrogant Imperialist Project " on MSN, as usual, hard hitting, copiously annotated and right. The Declaration on the Importance and Value of the Universal Museum (DIVUM) of 2002 in now 10 years old. [...] The DIVUM is a very remarkable document that differs essentially from other declarations and documents that include in their title “Universal”, such as the Universal Declaration of Human Rights . Whereas the latter aims at uplifting mankind from the miserable and abject conditions into which it has been plunged by unjust and oppressive systems and conditions, DIVUM was aimed at consolidating the results of oppressive systems and preventing the victims from attempting to reverse the results of imperialist adventures. In effect DIVUM was advancing the argument that there should be no attempt to seek to reverse the transfer of artefacts that had been acquired under colonial and other violent and oppressive conditions [...] The British Museum which had engineered the whole project was not one of the signatories but the handwriting of the museum’s officials is all over the document; the language and style of the DIVUM can be traced to Bloomsbury, London. Kwame Opoku has a well-argued response ( Restitution and Recent Upheavals in Egypt , March 24, 2011) to the comments of the antiquity dealers and collectors lobbyists alleging that the recent looting in Egypt shows what a bad idea restitution of scattered cultural heritage to their source countries is. Those who are against restitution will use the present situation as an excuse for rejecting the restitution of certain items. I started this blog three years ago. Its purpose was to separate the discussions of pre-1970 repatriation issues from the discussion on the main blog of the ongoing despoliation of sites by antiquity collectors. I sensed that the mixing of the two separate (in my opinion) issues was clouding the debate, and it is my suspicion that this was being deliberately done. So I wanted to explore it separately. Obviously, these results are skewed. They reflect what caught my eye rather than being a statistical survey. Nevertheless, it seems that the picture is not entirely an artefact of my own interests. There is a massive campaign on behalf of the Parthenon marbles. There was a lot of pressure from Egypt not only about current loot, but loot of an earlier period, though the latter seems to have quietened with Zahi Hawass losing his position in the Ministry. Turkey has now taken the lead in insisting on the return of pre-1970s losses, though the peak was rather more last year than this. The controversy about US museums and their attitudes will not go away. The Benin campaign of course owes much to the tireless activity and forceful arguments of one academic Kwame Opoku. The relative prominence of African art issues stem from colonial history and the size of the continent. Human remains taken in colonial times also raise many easily recognizable concerns. There seems to be a dearth here of South and Central American topics, but Donna Yates' blogs currently fill in those gaps quite well. It does seem that the current repatriation debate does have certain foci. In 2014 I will give some thought as to where this blog is going, if anywhere. Comments welcome. I'd also like to hear from other bloggers doing the same topic. Ife History, Power, and Identity 1300, Cambridge University Press,2015. Preface. In the wake of a 2009 Ife exhibition, Dynasty and Divinity: Ife Art in Ancient Nigeria, initiated by Botin Foundation in Spain, several thoughtful articles were published that addressed these works around issues of cultural patrimony. 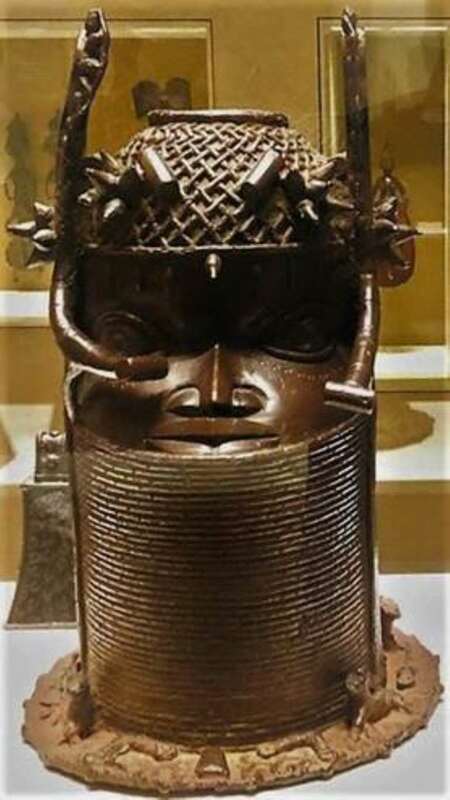 ‘Ile-Ife Triumphs in the British Museum, London: Who Said Nigerians Were incapable of Looking after Their Cultural Artefacts,’ asks Kwame Opoku, in his blog entry of 18 April 2010. With another equally salient title, he challenges us: ’Are Major African Art Exhibitions Only for the Western World? Ife Art Exhibition Begins in Spain but Will Not Be Shown in Nigeria or Any Other African Country.’ (23 June 2009). As he inquires in the later piece: Do young African artists, unlike their European and American counterparts, not need to see such exhibitions? Soon all the experts on African art, including Ife art, will be Europeans who will be paid or generously funded by the rich American foundations to come and teach us African art…. [T]here should be reciprocity, mutual respect and a balance of interests. Collaboration should not be a one-way communication’’ (Opoku 2009). Evoking some of the same issues as related to these ancient African works, Opoku adds: In the absence of adequate pub lic information, one is left to wonder whether the exploitation of African cultural resources follows the same pattern as the exploitation of our mineral and other resources i.e. we supply cheaply to the great advantage of the West which nowadays does not even have to send in an army for whatever it wants as in the olden days. Somebody has to explain to the African peoples why we must continue to put our cultural resources at the disposition of the West when Western States do not show the least inclination to do the same for us. (Opoku 2009). Much more can (should) and hopefully will soon be done along these lines. Kwame Anthony Appiah (Cosmopolitanism ) also uses the Benin bronzes as he asks the question, "Whose Culture Is it, Anyway?" Some of the heirs to the kingdom of Benin, the people of Southwest Nigeria, want the bronze their ancestors cast, shaped, handled, wondered at. They would like to wonder at—if we will not let them touch—that very thing. The connection people feel to cultural objects that are symbolically theirs, because they were produced from within a world of meaning by their ancestors—the connection to art through identity—is powerful. It should be acknowledged. The cosmopolitan, though, wants to remind us of other connections. Kwame Opoku has also been commenting on these same bronzes (e.g. " Is James Cuno a “Nationalist Retentionist”? ", ModernGhana.com, July 4, 2008; see also a series of postings on Afrikanet.info ). His passionate essays have prompted me to hunt through some of the news archives to see what I could find about the dispersal of Benin Bronzes. I cannot pretend this is comprehensive list, but it gives a little bit of the background to this debate. Advocates for the protection of cultural property and archaeologists are often labelled "cultural property nationalists," socialists, and other things. But what about those who want to be able to collect or sell whatever they want without any concern as to origin or the circumstances under which it entered the market? Certainly, the notion that, for example, "I am an American and my property rights are sacrosanct - I should be able to buy and sell whatever I want - I'm only helping impoverished citizens in Ukraine" is just as imperialistic. COTTER Imperilled Legacy for African Art, AUG. 2, 2012, NEW YORK TIMES. Where does Africa itself stand in all of this? Is it merely the battleground on which science and commerce clash, a passive stretch of turf to be either righteously conserved or carved up and parcelled out? Or is it — could it be — an active, gainful partner in cultural exchange? TOM FLYNN The Universal Museum: A Valid Model for the 21st Century? Tom Flynn wrote in his acknowledgements, ‘Ton Cremers and Kwame Opoku continue to inspire through their determination to articulate contrarian positions on cultural heritage issues and thorny questions of reparation. Guest blogger Kwame Opoku continues to his prolific and insightful challenge of the Western museum establishment on matters of cultural patrimony and legal equity concerning looted African art in the West. His commentaries on Afrikanet draws the attention of significant readers and is a must read on the subject of African cultural patrimony and repatriation. He is also increasingly cited in other blogs that follow his frequent commentary. Recent reports that the British Museum and other Western museums are trying to forge a deal BBC-News Interview with Prof. Sylvester Ogbechie to return looted African artworks to Africa have prompted a lot of discussion. BBCNews interviewed me on the subject on September 4, 2017 and a clip of the interview is posted here . Contested Cultural Heritage: A Selective Historiography, Helaine Silverman, Springer, New York,2010. We thank Dr. Opoku and the Museum Secruity Network for making these insightful REFLECTIONS ON THE CAIRO CONFERENCE ON RESTITUTION: ENCOURAGING BEGINNING available to us. The article contains very useful notes and references as well.The April 7-8 Cairo Conference hosted by Zahi Hawass and Egypt’s Supreme Council of Antiquities can be viewed on New Tang Dynasty Television . Dr Kwame Opoku is an indefatigable defender of African culture and arts and writes prolifically for the return of Africa, stolen loot. JOSEPH NEVAMDOSKY. Review of Layiwola, Peju, Benin1897.com: Art and the Restitution Question. H-AfrArts, H-Net Reviews. October 2010. “Of Desecrated History, Memories and Values in Peju Layiwola’s Recent Works,” by Akin Onipede (Department of Creative Arts at the University of Lagos), is a travail that laments the violation of a people’s cultural heritage and shows how Layiwola’s art excites the conscience to expose Western chicanery. Kwame Opoku is a polemicist on cultural affairs willing to take on the likes of anti-repatriation advocates, such as James Cuno (director of the Art Institute of Chicago). Opoku is noted for positing sharp and lucid rebuttals. 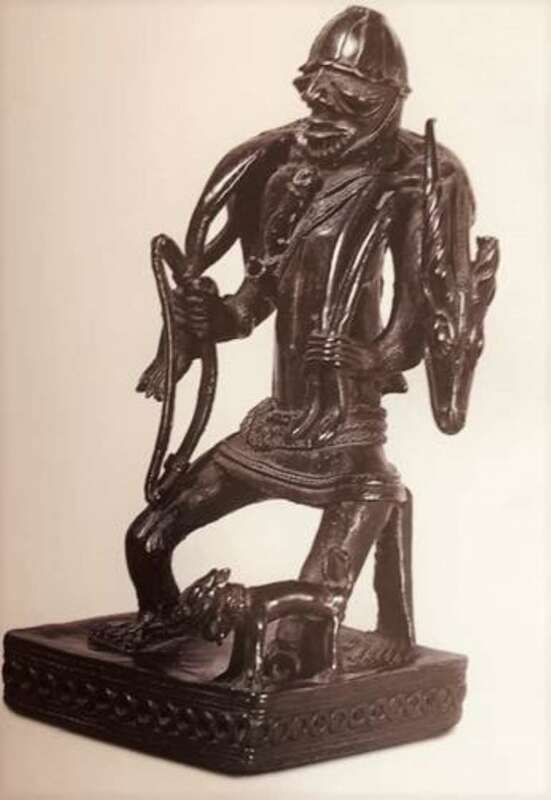 In “One Counter-Agenda from Africa: Would Western Museums Return Looted Objects if Nigeria and Other African States Were Ruled by Angels?” he takes up the hoary issue of secure and suitable locations for repatriated objects; this leads quickly to observations on obscurantist African leaders, indigenous looters, and local nonchalance. He takes head on a practical consequence of repatriation: what to do with returned loot and where to chamber it? There is a lot of petrol in these contributions, a fair share of angst and anger, retorts, and shifts in linguistic discourse from the language of the managers of art to the language of putative owners. The arguments for the repatriation of Benin objects are remarkably intelligent rather than histrionic. What remains wobbly and largely off stage is the fact that Nigeria’s museums are so unkempt and mismanaged as to not deserve that restitution. African Museums in the Making Reflections on the Politics of Material and Public Culture in Zimbabwe, (Eds.) Munaradzi Mawere, Henry Chiwaura and Thomas Panganayi Thondhlana, Langaa Research and Publishing CIG, Mankon, Bamenda 2015. This book mentions Kwame Opoku at least 7 times. The ever-erudite Dr. Kwame Opoku provides you with everything you need to know about the recent returns to Nigeria. Dr Opoku (like most of us) was quite surprised to see the Museum of Fine Arts return anything, let alone Nigerian objects. Any article he publishes is worth reading. It is instructive to compare the essays written by Naeem Mohaiemen during and after the Musée Guimet controversy. Mohaiemen’s earlier article, ‘Tintin in Bengal’, was written in the thick of the events, when the ﬁrst consignment of artefacts had reached France and the second was yet to leave Bangladesh. In it, the author admits he had ﬁrst been unsympathetic towards the protestors, but as they began to produce facts – inconsistent inventory lists, missing accession numbers, woefully low insurance values – he too felt that the exhibition was being managed poorly and with unseemly haste. Add to this a recent article by Nigerian-origin lawyer and crusader for the repatriation of artefacts to source countries, Dr Kwame Opoku, who averred that the Musée Guimet was ﬁlled with ‘thousands of stolen/illegal objects’, and Mohaiemen too began to feel anxious about the possible consequences of the exhibition. Included in this issue of AfricaUpdate are reflections on the repatriation of cultural heritage and a related conference that took place in Egypt earlier this year. The focus of Mr. Opoku's article is on the numerous looted artifacts in Western museums, and the determination of the countries, from which they were taken, to get them back. The author makes reference not only to the artifacts taken from African countries in the late 19th century but also to looted artifacts from countries such as Peru, Greece, Mexico and others. These countries have similar grievances over what is perceived as the wrongful appropriation of their national treasures. The author identifies Ghana, Nigeria, Ethiopia, Mali and Egypt among the African countries seeking the return of their artifacts. Mr. Opoku provides useful suggestions on the subject and suggests that the full proceedings of the Cairo Conference should be published. We are grateful to Mr. Opoku for making us aware of the ongoing struggle by Africans and others to regain their national treasures. ‘That description captures the undeniable pleasures and enlightenment experienced by those who can get there when they wander through well-lit galleries in London, Paris, New York and Madrid. After all,’ The British Museum’s collection is world-wide in origin and is intended for use by the citizens of the world’. But as the independent commentator and strong advocate for restitution, Kwame Opoku points out, the Director of the British Museum does not appear to be embarrassed that Kenyans, Ghanaians, Nigerians, Ethiopians and others have to come to his museum in London in order to seek materials for their history. That some citizens are privileged’ to be able to sample aspects of cultures from around the globe in one place is a social good, particularly if it is a good of creative inspiration, combats prejudice and leads to understanding between peoples. Bringing ancient Chinese, Persian, Mesopotamian and Nigerian culture to London is a political as well as cultural act. But the traffic is usually one way. 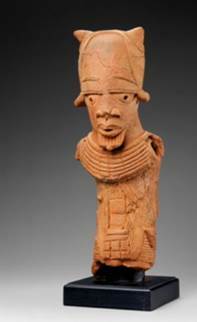 The 2009 exhibition Dynasty and Divinity in ancient Africa, opened in Santander, toured to New York and London, but was not even seen any African country’. p.250. As Opoku patiently explains,’ I often think that many of the controversies regarding restitution could be solved or at least be rendered less acrimonious if the holding museums used sensitive and less offensive language and behaviour’. P.251.